I drove my two kids to the fairgrounds yesterday to meet with all the school districts to compete in the cross country race. It was a mad house. 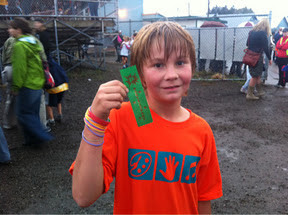 My kids were pumped with excitement, they have been training for this race for a few weeks now and they were ready. They had their shirts, their shorts, the right shoes, and they were turned on! 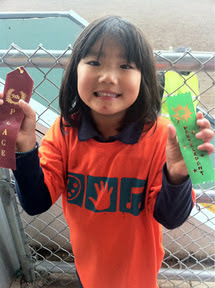 The kids raced by age, so the kindergarten kids went first, then our daughter being in first grade was up next. All the first grade kids lined up at the starting line, in the mud, and waited for the bang of the gun to go off. As I looked around the stadium at all the parents it was amusing to see the different expressions on their faces. Some parents were excited, others concerned, some were anxious and worried. Some parents were having difficulty letting their first grader be on the start line all alone and wanted to down there huddled over them to protect them and keep them safe. Other parents, me included, were rejoicing over the fact that my first grader was down there and not hanging off my skirt strings! The gun went off and they went. My daughter was right in the middle of them all, and I was cheering her on. I wasn't at my cheering best, because I had a headache, but I did try. Third graders went, then my son was up next. He was equally as excited as our daughter. He was the first one in line. He stands taller than his classmates so he is easy to spot, and this is a good year for him, so it's exciting for us to watch how happy he is. He was hi-fiveing the coach, and dancing on the field and I was praising Jesus for giving him such joy and freedom! When the gun went off, so did he. He kept a good pace all the way around the field and by the time we made it to the finish line to pick him up, he was there! Pictures were snapped, hugs were given, congrats were spoken. It was a good race. This race, the one I'm in with Jesus, it's the only one worth running. Living life with Him and with His people right to the finish. If I get off the track and go some other way, then it's not worth my time or energy anymore. This is the race I believe in, the race of eternal life with Him. He has given me His gift, and I'm going to take it, and live it. It is good. Say that Again, Jesus, Your race is the only one worth racing, right to the finish line!